The Yankees came into this weekend series with the Texas Rangers reeling having lost seven of their previous eight games. In desperate need of a turnaround, a bit of optimism filled the air as the Yankees would have their chance at piecing together a couple wins against a less than stellar Rangers team. Unfortunately, the struggles continued as the Yankees were swept in disappointing fashion. A classic cliché in the sports world is that the scoreboard doesn’t always reflect how close a game truly was and this was adversely true for the Yankees in this case. Although the team fought back to lose in a one-run game, this game was not close in the slightest. With Michael Pineda on the mound, his inconsistency over the past couple starts (excluding his masterful Mother’s Day performance) continued all beginning in the 3rd inning. The Rangers were able to put a 7-run inning together thanks to some spotty defense and key hitting. Uncharacteristic wildness also hurt Pineda as he allowed a walk during that inning before making a throwing error on a bunt where hesitation on his part hurt him. With the bases loaded in a 0-0 game, Didi Gregorius badly misplayed a ball giving him his 5th error of the season which allowed two runs to come home. Pineda then gave up a few hits before allowing back to back home runs to Prince Fielder (3-run) and Mitch Mooreland (solo) to make it a 7-0 game. Pineda managed to go 6 full innings allowing 8 hits, 7 runs (4 earned), 1 walk and 4 strikeouts. The ball was then handed over to Chasen Shreve who allowed 2 runs in one inning of work and David Carpenter who continued his poor pitching allowing one run in one inning. Fielder was all over Yankee pitching going 2-5 with two home runs and 4 RBIs. I give the Yankees a lot of credit for showing an never-quit attitude in this game after falling behind 7-0 after just 2 and a half innings. The team very could have rolled over but the offense was able to come alive. Slade Heathcott made what was a highly anticipated first start and boy did he come through. In his first career at-bat, Heathcott raked the pitch into the left center field gap that was cut off by the centerfielder as Slade hustled into 2nd base diving in with a double. Heathcott would collect another hit going 2-3 in his first start. In an additional sign of optimism, Gregorius was able to hit his first home run as a Yankee with a hard hit 3-run homer that got the Yankees on the board in the 4th inning. Garrett Jones then hit a 3-run home run of his own to make it a 10-8 game in the 8th inning, his first as a Yankee. Alex Rodriguez tied Babe Ruth on the all-time RBI’s list with 1,992 on an RBI single in the 7th. Mark Teixeira made the game even more interesting with a solo-shot to make it a one run game in the 9th only for the comeback efforts to be squandered. Despite getting base hits from every Yankee starter, the team dropped the one-run game. If you were coming into game two as a frustrated Yankee fan (as most of us were), game two of this series was not for you. After racking up 7 runs in the 3rd inning in game one, the Rangers put up 10 (TEN) runs in the 3rd inning of game two. CC Sabathia got the start for the Yankees and he had one of the worst starts he’s had as a Yankee as it was his shortest non-injury start in his time with the team. 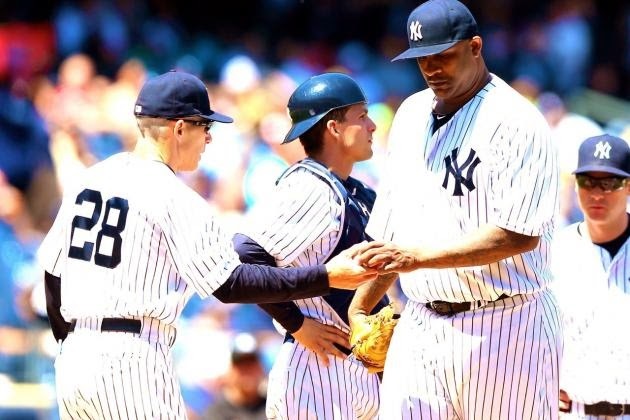 CC lasted just 2.1 innings as he couldn’t get out of the third inning after allowing 7 hits, 6 runs (all earned), 1 walk and 4 strikeouts. You can only give the Rangers credit for their 10-run third inning as they flat-out hit the baseball. Shin-Soo Choo capped off the inning with a 3-run blast off Sabathia’s replacement, Esmil Rogers. Rogers wasn’t any better than Sabathia as he went 3 innings allowing 4 hits, 7 runs (all earned), 3 walks and 3 strikeouts. Brandon Pinder then came in and allowed his first two earned runs as a major-leaguer giving up a home run to Prince Fielder as he continued to mash Yankee pitching. Garrett Jones made his first career appearance on the mound using his repertoire of a “slow fastball and nasty changeup.” He also busted off a couple of curve balls getting two outs allowing just one walk and no hits or runs. 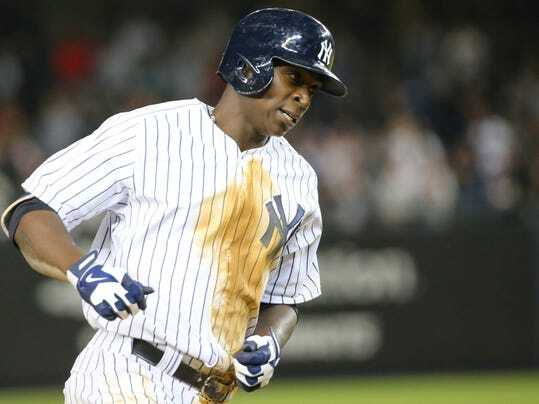 On the offensive side of things, Didi Gregorius hit his second home run of the season just one day after hitting his first as he found his power stroke. Carlos Beltran also bumped his hitting streak up to 13 games with a home run of his own. Overall, the Yankees got beat by a fantastic young pitcher in Nick Martinez and the Rangers outhit the Yankees 15-7 while outscoring them 15-4. In similar fashion to what we saw against the Rays, the Yankees scored 2 runs in the first inning, but that was all they could manage during the course of the game. Brian McCann collected a 2-RBI single to put the Yankees ahead going into the top of the second. Chris Capuano struggled a bit allowing 3 runs in his first two innings of work before settling down a bit as he finished with 4.1 IP, 8 H, 3 R (2 ER), 0 BB, 4 K. The ball was then handed off to Chasen Shreve who tossed 1.1 innings of no-hit ball. Justin Wilson then took over as he pitched poorly as he was chased after letting up 2 more runs on 3 hits. Dellin Betances and Andrew Miller both pitched one inning as miller struck out 2 of the 3 batters he faced. David Carpenter was not good in his one inning pitching but was helped out by a failed suicide squeeze; otherwise he likely would’ve allowed a run. The Yankees finished with just six hits including two from Garrett Jones and Chase Headley as they fell 5-2 thus being swept by the Rangers. Brian McCann suffered a foot injury and is day-to-day. The team and its fans are obviously fed-up but we must remain positive. The team started the season 3-6 before jumping up to first place in the AL East with stellar play over its next three weeks of play. The Yankees are in the dumps after a 2-week slump but the hope is that they reverse the slump and take 2 of 3 games from the Royals. Jacob Lindgren was officially called up Sunday and I’m looking forward to seeing him take the hill at some point in this series to help a bullpen that hasn’t been as advertised outside of Betances and Miller. The lack of motivation was seen particularly in games two and three of the series although the team did show a lot of heart in game one. The series was filled with areas of optimism and disappointment but they’ll surely turn it around as they always do. However, it is never fun to lose much less get swept. Bernie Williams beloved #51 was retired on Sunday as Yankees legends were all present from Joe Torre to Jorge Posada to Andy Pettite to Mariano Rivera and, last but certainly not least, the Captain, Derek Jeter. It was Jeter’s first game back at the stadium and I’m sure it meant a lot to Bernie that they were all there as Bernie was an integral part of four championships. The ceremony was very touching and the first of three this season with Posada and Pettite’s days to come later in the summer. We would’ve all like to see a win on Bernie’s special day as the pre-game festivities were more enjoyable than the game. To begin this “looking ahead” heading, I will start with some retrospect. Despite being 1-9 in their previous 10 games and losing their last 6, the Yankees are still just 1.5 games back from first place in the AL East behind the Tampa Bay Rays. Unfortunately, the team has fallen to .500-ball with a record of 22-22. 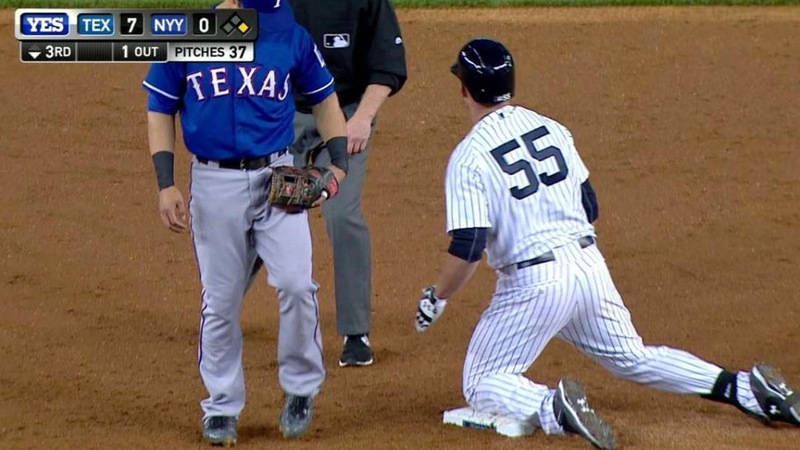 To make matters worse, the Yankees will host the 2014 AL Champions once again, the Kansas City Royals. Game one will likely feature Nathan Eovaldi (3-1 4.73 ERA) against Jeremy Guthrie (4-2 4.75 ERA). We should see Adam Warren (2-3 4.26 ERA) against Danny Duffy (2-3 5.87 ERA) in game two. In the series finale, Michael Pineda (5-2 3.59 ERA) will have the ball against Chris Young (4-0 0.78 ERA).